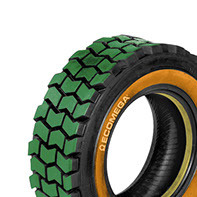 Ecomega, one of the leaders on the international tyre market, has designed a new set of SKZ tyres for skid steer loaders. Thanks to its highest expertise and many years of experience, Ecomega has always provided SKZ tyres solutions that would fit any construction needs you might have. Ecomega SKZ tyres feature maximum reliability, exceptional performance and safety, even while operating under the toughest environmental conditions. Thanks to the use of the most advanced technologies, Ecomega SKZ tyres are the best choice on the market if your are looking for highly efficient tyres for your construction needs, anytime and anywhere. Ecomega SKZ tyres will ensure your construction operations run as smoothly as possible over time. One of the best features of Ecomega SKZ tyres is their maximum versatility. Thanks to their enhanced trade pattern, Ecomega SKZ tyres guarantee maximum traction on different types of surfaces, including the most difficult ones. Ecomega SKZ tyres feature enhanced tread life that would significantly reduce your maintenance and repair costs over time. Ecomega SKZ tyres feature wide sidewalls and extra deep tread, to ensure maximum protection against different types of accidental damages, such as ruptures and cuts. Thanks to the use of the latest technologies, you are in safe hands at any time, even while working on the most challenging surfaces. On top of their enhanced design features, Ecomega SKZ tyres offer a larger footprint, that guarantees maximum durability and even-wearing tread pattern. Your construction operations has never been as smooth, thanks to the new set of Ecomega SKZ tyres. 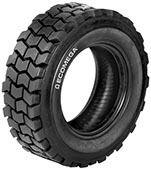 Ecomega has provided excellent and highly efficient tyres for many skid steer loaders worldwide. Thanks to the highest expertise and the use of the most advanced technologies, Ecomega’s experts have engineered a new set of SKZ tyres. Ecomega SKZ tyres guarantee exceptional performance, maximum durability and safety, even while operating on the most challenging types of surfaces.